Last week I competed my DAFNE course and it was amazing! DAFNE stands for Dose Adjustment For Normal Eating, and it really does let you eat like a normal (non-diabetic) person. Having known Mel for a while I knew a bit about carb counting, but didn’t realise how much I was missing out on by not going on this course. The course was run by a specialist diabetes dietician and a DSN (diabetes specialist nurse). There were six people with type one in the room, which was interesting to learn how people dealt with all aspects of living with type one diabetes (T1D). 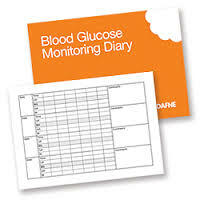 We were presented with a workbook, a blood glucose diary and a carbohydrate portion (CP) list. We were first taken back to basics with T1D just to make sure everyone was on the same page. The atmosphere was extremely relaxed and left room for questions for everyone to ask if need be. Throughout the week we talked about diets and insulin a great deal, and I was shocked to learn how my insulin actually works. 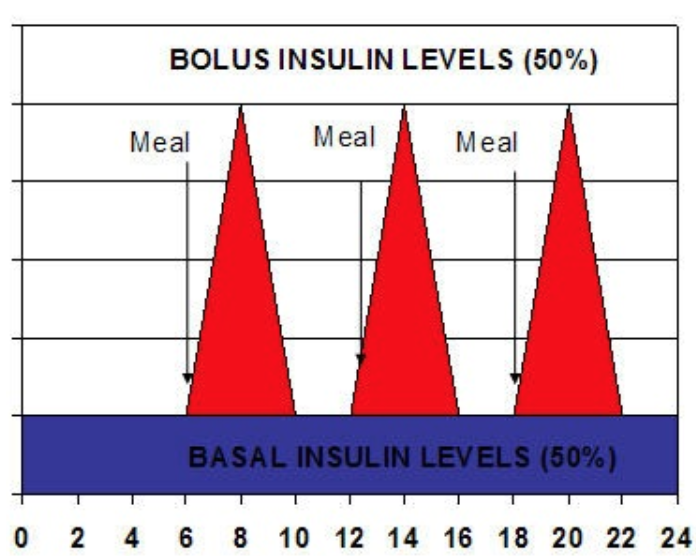 Background insulin (also called basal) runs throughout the day to maintain the BG level in the body. Many people in the UK use Lantus or Levemir for this. As someone who used to take Lantus daily, I found that by around 20:00-21:00 my BG would start to peak, even though I hadn’t eaten any cake!! So upon this discovery I was recommended by the specialist diabetes nurse to split my background insulin. This has allowed me to alter my day and night time insulins as fit! Meaning reduced hypos in the night... massive win!! 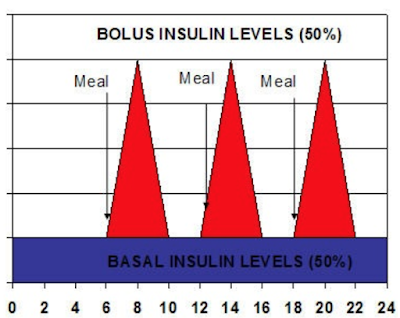 The diagram above shows that the fast acting insulins, such as Novorapid or Humalog, are injected at meal times to cater for the intake of carbohydrates at that time. This is where the counting of carbs takes place. From the diagram below it’s easy to see how (University of Columbia). Every 10g of carbs is called a carbohydrate portion (CP). For example in one slice of bread there are on average 15g of carbs. Or, in DAFNE lingo, 1.5 CPs. Everyone starts on a 1:1 ratio, so 1U of insulin for 1CP. So for that slice of bread I would inject 1.5U. Then when testing just before the next mealtime, providing your basal and ratios are correct, the theory is that you should be the same level! Hurrah! One CP should bring up your BG (blood glucose) by 2-3mmol/l and one unit of insulin should decrease your BG by 2-3mmol/l. However this is different for everyone so please talk to your DSN and dietician before trying this! Having had this explained I cannot understand why I was not told this right from the off when being diagnosed! And also, why I was initially on an insulin which lasted around 8 hours (fine for the night time) but therefore leaving me with no background for the day! But that’s in the past, so never mind. All these tools and more allow me to look at my blood glucose levels to see where the problem lies, and how to fix it. If I was low throughout the day I learnt how to decrease my morning basal, and when too high then to increase it. It’s truly amazing what I’ve learnt on the DAFNE course. I walked out of there on Friday with the confidence that I can now control my diabetes, and even better I know why sometimes things just don’t seem to go right! I would recommend everyone who has T1D attends this course! The freedom that this has left me with is amazing. The coursework book has everything you need with it and there’s online forums to have a cheeky browse through as well. Everyone on the course is there for one main reason, to control their diabetes monster. Everyone is in the same boat which makes you feel part of something amazing. Think about asking your diabetes specialist to refer you for DAFNE, it truly is life changing.